This critical summary of a systematic review published in 2010 was prepared under the auspices of the American Dental Association Center for Evidence-Based Dentistry. 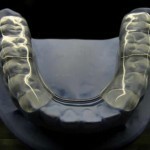 The original review was addressing the question of whether intraoral orthopaedic appliances reduce pain in patients with temporomandibular disorders affecting muscle and joint (TMJD) compared to subjects receiving placebo control, no treatment, or other treatments. The summariser noted that the review was conducted relatively thoroughly, although restricted to English language studies. The included studies were of short duration and used a variety of non standard pain measures. Heterogeneity meant that the majority of studies were synthesised qualitatively.